Hot nights and sweaty sheets are no fun for little babies trying to get to sleep. While you can get up, strip off and reposition a fan to cool down, your baby can’t manage her temperature so easily. At what room temperature will my baby be safe? A room temperature of between 16-20ºC (60.8-68ºF) is recommended – 18ºC (65ºF) is just right. How many layers does my baby need when sleeping? Your baby’s cot should be a comfortable and safe sleep environment but sadly it can also pose a serious risk to your baby’s health. Every year around 300 babies in the UK die of Sudden Infant Death Syndrome (SIDS) and the cot can also pose risks of strangulation, suffocation or entrapment. However, a few simple steps will make your baby’s sleep environment safe so you and your baby get a good night’s sleep. Follow our guide for some tips. Many people think it’s important to keep baby’s room extra warm but this is not true. In fact, it’s better for your baby’s health if the room is slightly cool. Try to keep the temperature at around 18C/64F – in warm weather you can use a fan to lower the temperature. When selecting a cot choose one with a firm mattress that is safety-approved and make sure it hasn’t been recalled for any safety issues. If you’re using a second-hand cot check it carefully for faults, damage or missing pieces, and don’t use it if it’s not in perfect working order. Young babies might be more comfortable in a Moses basket – but don’t ever let your baby sleep on a regular bed, chair or sofa because there’s a high risk they will roll off and injure themselves. Cover the cot mattress with a fitted sheet to reduce the chance that your baby will become tangled up with it in the night. Pillows, bumpers, sheepskins, comforters or quilts should not be used as they all pose a risk of suffocation, and toys should not be left in or near the sleeping area. Duvets can also be dangerous and may make your baby too warm. A sheet and one or two open weave blankets will help your baby moderate their temperature during the night. If your child is a wriggler a sleep sack will stop them throwing the covers off. Unless your doctor has advised otherwise, you should always put your baby to sleep on their back as it is the safest position. Once your baby is older they will start rolling from back to front and back again – at this stage you should still place them in the cot on their back but don’t worry about putting them back when they roll as they are mobile enough to manage this themselves. Up until the age of six months it’s a really good idea to have your baby’s cot or Moses basket in your bedroom. Not only is it easier for you to soothe your baby in the night when the cot is so close, but research has found that the risk of SIDS in the first 6 months is reduced when the cot is in the parents’ bedroom. 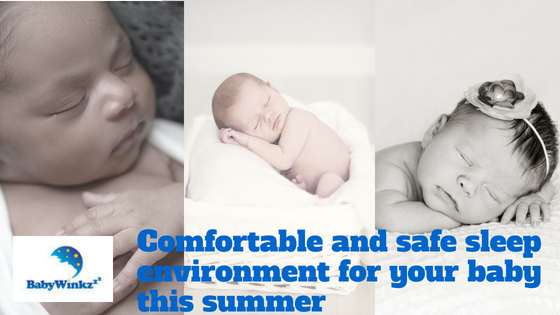 By following the advice above you’ll be able to create a safe and comfortable sleep environment for your baby. You might also find blackout curtains are useful, as they can help babies differentiate between night and day and settle quickly into a good bedtime routine, and white noise such as the hum of a fan can help your baby relax too. What have you done to your child’s room to promote sleep? What other methods have you used to produce a comfortable sleep environment? I love to hear from you, the information you share will benefit other parents. Baby Sleep - Why is sleep important to health and well being?